Do you ever think about the butterfly effect? What about the moments of your day, turning left instead of right, going when you didn’t feel like going or staying home with that special sixth sense – crossing the road five minutes before, or leaving an hour late…what about your day may have changed the universe as you know it? The infinite possibility of what if, that hope that is the root of all dreams. Tomorrow may be the day that you have that breakthrough. Five minutes from now, you may see or touch something that gives you a peace instead of living in grief. You may end today a widow(er) or having met the most honest love you’ve ever known. Somewhere in the world, not far from you, lives are ending and beginning, changing and remaking. Into the vast universe, we all send the wisps of our own wings. What does that mean, step on a butterfly today, kill a million people three years from now? The phrase refers to the highly debated scientific idea called “chaos theory” and it goes something like this. It is possible that a butterfly’s wings might create tiny changes in the atmosphere that may ultimately alter the path of a tornado, hurricane or storm. It could delay, accelerate or even prevent the occurrence of an event like a tornado in another location. The flapping wing represents a small change in the initial condition of the system, which causes a chain of events leading to large-scale alterations of events. Had the butterfly not flapped its wings, the trajectory of the system might have been vastly different. Had you made one choice over the other, the result of your life, your circumstance would in unalterably different, causing a whole new set of things that the other timeline you is dealing with right this very second. 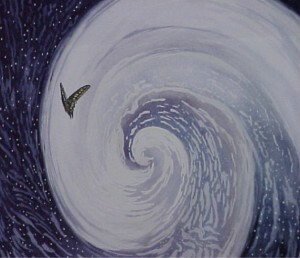 While the butterfly does not “cause” the tornado in the sense of providing the energy for the tornado, it does “cause” it in the sense that the flap of its wings is an essential part of the initial conditions resulting in a tornado, and without that flap that particular tornado would not have existed. What changes has it caused in the world that I went rock climbing one day, or met a person in the hospital, that I went home instead of waiting, that I said yes instead of no? What unalterable history dissolved into a new reality? There is a movie by this title that features a really good acting job by Ashton Kutcher. I liked the movie, and was again considering today the repercussions that sometimes come with the decisions that we have made for us in our lives. In the end of the movie, the hero has tried everything that he can to save the woman that he loves from fates both of death and of sexual abuse. In the end, the thing that really saved her was sending her away. Although he wasn’t the one hurting her, it was the fractional of his movement in her life that started the hurricane. On days like this day, when I am a little tired and recovering from way so much excitement yesterday, I am also aware that I’ve sharply turned the course of my life. Yesterday was that moment of discovery; new sights and sounds, new graduate program, new life. 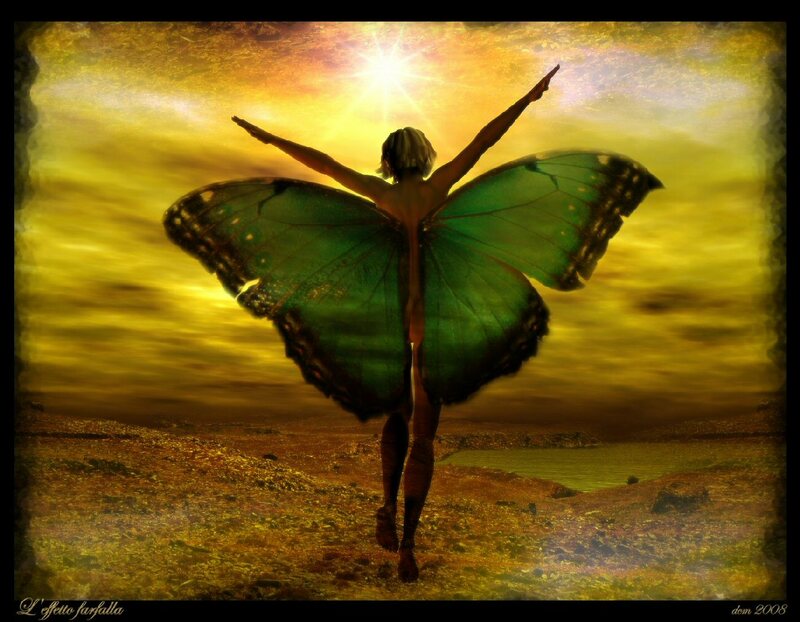 I’ve been released from the chrysalis….and I wonder, as I stretch my metaphoric wings, what effect that will have? I am sometimes surrounded by the questions and doubts of decisions that I’ve made, as I am sure that you are from time to time. It it easier when you know that you’ve made it this far in the company of others like you, living in the moment, knowing that in the future you’re going to feel whole and well about the changes you’re embracing with shaking hands now? Sometimes, I think that is the hardest thing that we have to learn in life – to recognize that sending oneself away from the pain another person’s life is the only positive contribution that we can make. I love the idea of the butterfly effect. It’s so….full of possibility. No one has ever drawn if out for me far enough, how the delicate balance of time all plays out. There are moments in meditation that I feel like I almost come to understanding this one elemental piece of the universe….and then it fades.